I'm here! New job and adjusting my style. Hey all- I'm here- I'm here. Guess what though? It hassss been an adjustment however. As confident as I like to imagine I am about my outward persona, I know that in meeting the hundreds of people who work here, I'll be making a ton of first impressions in a short amount of time. So what do I do? 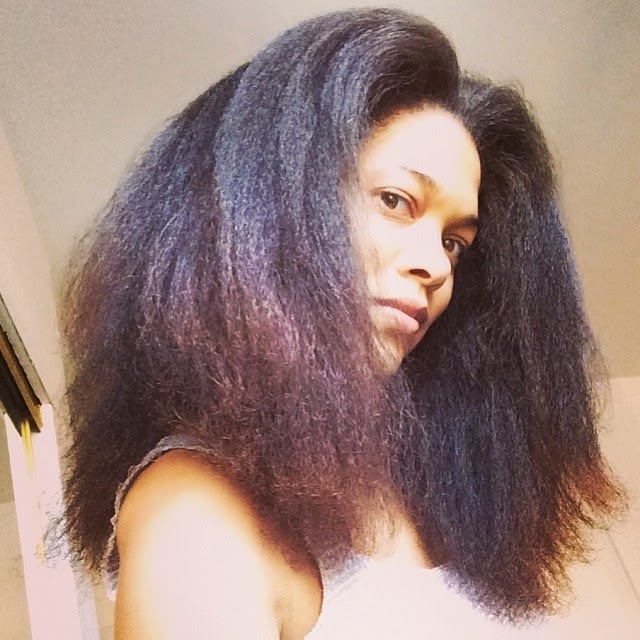 Wear my hair out and big in all it's pretty glory- and thus risk distracting the unsuspecting new co-workers with a cloud of curls on a new girl named "Niambi"? Or do I pull it back and just be the designer from upstairs? I opted to pull it back for my first two days (I started on a Wednesday) and wear it out on Friday in a full-blown wash and go. This week I did the same thing- sort of reversing my routine. Usually I wash my hair on the weekends and wear it out on Monday and Tuesday, maybe Wednesday and then slowly put it away. These past two weeks I have washed my hair on Thursday night and wore it out Friday and through the weekend, putting it away on Monday. I did get validation that I'd made the right decision. When I wore it out last Friday, the first thing that several people said when they saw me was "OMG- Your hair"... They said it while smiling, and I also heard "cute" and "I could never"... So indeed, it was a little distracting at first. Though I have strong beliefs about women accepting and loving what they were blessed with, I am also aware that our hair is "different" and that stereotypes can distract people from who we really are. It's just hair - it's not a helmet of battle, or a crown of queendom, or a kufi of curling smoke, or a hood of rebellion. Those facts will come to light as soon as we become truly acquainted. But sometimes... I just don't feel like pushing through those barriers. No, I will not make my hair like YOURS to alleviate your discomfort or curiosity. But I can make it a little smaller, and a little less "in your face". We can wear jeans here, so it's more a business casual environment and I know I will go back to wearing my hair out once people know WHO I am. Congrats on the new job, your hair is absolutely gorgeous! Rock it girl. I sincerely don't understand why people feel the need to offer the unsolicited commentary, but I'm personally experiencing the side eye enough to know your concerns are valid. I think it's great you went with your gut. You look lovely and your hair rocks. Wear it with pride! i totally love your hair both ways and i think it's very gracious of you to think about others while still being true to yourself. i guess we really are responsible for educating the rest of the world about out true selves. your approach was very cool! congrats and good luck on your new journey! Your hair is awesome!! I love how full it looks. Congrats on the new job!! I too like to slowly introduce new coworkers to my big hair by wearing it pulled back for a bit, then letting it take over on a Friday after I've been there for a week or so. Congrats on the job. I usually tuck my hair back for interviews. LOVE your hair in the pic with the green shirt! I really hope mine will do that. Missed your posts! Big congrats on the job. Love your flat twists...they're always perfect. Hello I really have no idea how I got here. I was typing so fast I looked up and there you were. I was intrigued so I read on including the feedback. I must say your a beautiful sister and the hair is TOOOOOOOOOOOO DIIIIIIIIIIIIIIIIIE!! Although I relax my own hair. I would give my right arm and will throw in a leg for good measure to have your mane!!! Absolutely stunning sister-girl! And I'm 100% Heterosexual. It is what it is as they say here in Ga. Yes my beautiful sister congrats on your new career! I truly understand your dilemma. I work in local government (in the South) and I battled with my hair style choice when I first went natural, which was about 18 months ago. At first I wore my hair in a very "conservative" puff or ball. After a while I said "bump it". 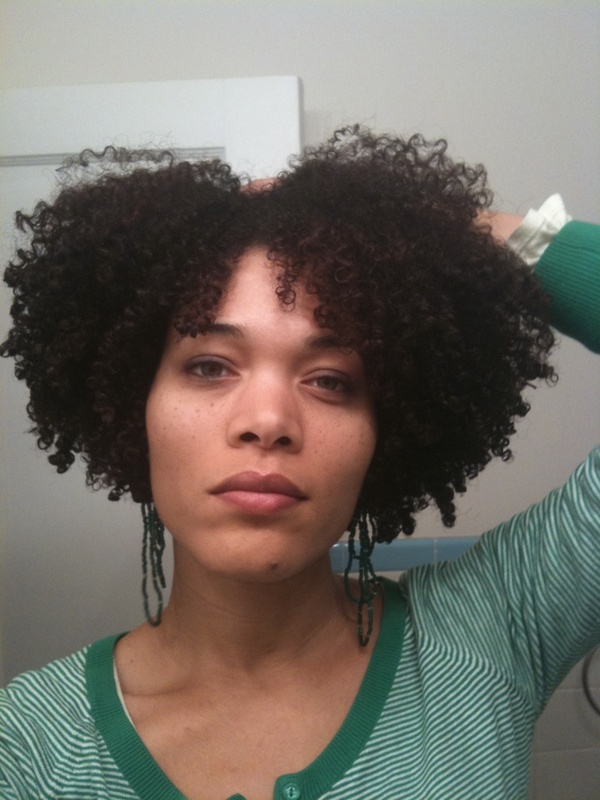 I love my hair and I'm confident in the way it kinks and coils. Me being the only black person in my department, I was unsure of what the outcome would be, but I can say that they have been very accepting and my hair is not really a topic of discussion anymore. Congrats on your new job!!!! Btw, I love your hair!!!!! First and foremost, congrats on the new job! I think when it comes to how we wear our hair at work we must go with our gut, but I must say, regardless of how you chose to wear your hair, it's gorgeous! I love your hair out but I'm biased. LOL When I first started the job I'm currently at I wore my hair small. It started off small and I just let it get bigger and bigger. I've been working there for a year now and they have seen me walk in with a full blow out. Everyone likes my hair big and I get so many compliments. I'm sure you will be wearing your hair out and full in no time. Good luck hair twin! I can understand how you felt initially, and I applaud your slowly letting it do what it do. They'll get used to it. @Nettie I'm glad Shingai is getting more love- even if it's person by person! Yay @ Neeta! I'm glad you got positive feedback. Seems like that's what happens 80% of the time- yet we worry so much about it. The gratuitous shot doesn't look too "in your face" to me. LOL You're in the door, plus, it's sounds like a casual environment (jeans)...I say wear it out:) Your hair is gorgeous. Congrats on your new position!!! Thanks for posting this. I'll be job hunting soon and was wondering what to do for job interviews. It's funny because your hair is so tame to me...nice shape and coils defined. Cracks me up to hear other peoples' reactions. Wow, it's been a while, got here from pinerest. I'm male and really do appreciate natural beauty. Great look, hope kept it up. Natural Beauty! Bless! @justhairblog - I'm current on the gram! Eye brows are hair. Can we talk eyebrows? Wet Line Xtreme Gel, KMF gel changes formula!! There Are 50,000 Thoughts Standing Between You And Your Partner Every Day!